Cold sore is also known as fever blisters and is caused by the virus called Herpes simplex. It is said that at least 6 out of 10 people suffer from cold sore at least once during their lifetime. Cold sore causes small fluid filled blisters to appear around the mouth or lips. These are painful and often accompanied with fever, sore throat, tiredness, swollen lymph nodes and so on. A fluid comes out when it breaks. These sores disappear within a period of two weeks. Aloe gel is great for healing cold sores. It provides you relief form the pain caused by cold sore and also heals it faster. Apply aloe vera gel over the affected area and wait for a few minutes. Wash off with water. You can use it 3 to 4 times per day, till the cold sore disappears. 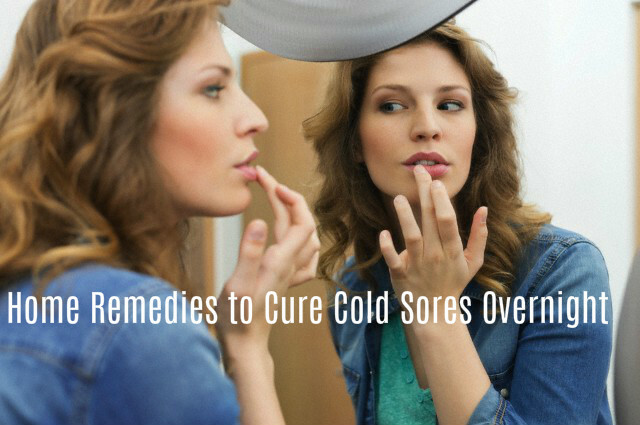 Often the pain due to cold sore becomes unbearable. An excellent remedy for it is to apply a paste of baking soda over the cold sore. This provides you relief from the pain and irritation and also makes the healing process fast. Take 2 tablespoons of baking soda and ¼ cup of water and mix both to get a paste. Apply this over the cold sore and leave it for a few minutes. Rinse with water. Remember not to scrape off the dry paste from your lips. This can make things worse for you. You may apply this paste once or twice daily. Cornstarch has great healing properties and therefore good for treating cold sore. Since Herpes simplex virus grows well in an acidic medium, cornstarch helps in preventing its growth by keeping the pH level of the cold sore neutral. It also provides you relief from the inflammation caused and the pain. Take 2 teaspoons of cornstarch and mix it with water to get a paste. Apply this on the cold sore and leave it for 10 to 15 minutes, till it becomes dry. Rinse off with water. Apply it once or twice a day, till the sore is healed. Common salt has alkalizing properties, which help in preventing the growth of bacteria and reducing the swelling caused as a result of cold sore. Apply some common salt over the cold sore and massage for about 30 seconds. You can apply it twice a day, till the cold sore is healed. Garlic has antibacterial and antifungal properties, which help in curbing the growth of Herpes simplex, the virus responsible for causing cold sore. Chop 3 to 4 garlic cloves and crush them to get a paste. Apply this paste on the sore and let it remain for 10 minutes. Wash off with cold water. You can do this 3 or 4 times a day till the cold sore gets healed. Before you start this remedy, you have to consult your doctor. Green tea is good for your health and effective for getting rid of cold sores. It has antiviral properties, which help in fighting against theHSV-1 virus. Green tea is also good for removing toxins from the body. Make green tea by steeping it for 45 seconds to 1 minute and have it daily. You can drink 2 cups of green tea every day. Honey is an excellent home remedy for cold sores. This is because honey is a good moisturizer and helps in keeping the sore moisturized. This speeds up the healing process. Dab some honey over the cold sore and leave it on them. Do not lick your lips after you apply honey. You can apply honey every 3 to 4 hours, till you get relief form cold sores. Take an ice cube and place it over the cold sore. This will help in reducing the swelling and also provides you relief from the pain caused by the sore. Since the virus casing the cold sore grows well in a warm atmosphere, ice helps in preventing the multiplication of virus, thus healing the sore. As soon as you notice that you are going to have cold sore, rub an ice cube over it. You may rub it directly over the sore or wrap it in a towel and rub it. Apply this frequently till you get relief from the sore. Lemon balm ointment or tincture is good for treating cold sores. It contains rosmarinic acid, which can treat the lesions caused by the virus responsible for cold sores. Apply this ointment on the cold sore twice a day till it is healed. Apply petroleum jelly over the cold sore. This will protect it from dust and bacteria and prevents the infection from getting worse. It also helps in keeping the sore well moisturized, thus preventing it from cracking. This speeds up the healing process. You can apply it over the cold sore before you have your bath and at night before you go to sleep. Do this daily till the sore is healed. When you apply sunscreen on your face, neck, arms and hands, you must also remember to apply it on your lips. Sunscreen helps in preventing cold sores, and if you have them, heals them fast, because UV rays of the sun can cause an outbreak of cold sores. Apply a lip balm with minimum SPF 15 protection before you go out in the sun. You can continue applying it even after the cold sore is healed. Vanilla extract has the power to prevent the multiplication of Herpes simplex virus. The antioxidant and anti-inflammatory properties of vanilla extract fight the infection and also reduce the swelling caused. It also provides a cooling sensation on the inflammation. Dip a cotton ball in to the vanilla extract and dab it on the cold sore. You can do this several times a day, till the cold sore is healed.